The Fourth of July is fast approaching, and it’s time to put together some patriotic outfits in preparation for all the fried food eating, fireworks watching, anthem singing and general merrymaking you’re about to do. After all, if you’re going to be out par-tay-ing it up in celebration of your country’s independence from the Kingdom of Great Britain, you might as well look good while you’re doing it, right? It’s what the founding fathers would’ve wanted. You’re not really celebrating Independence Day if you’re not exercising your right to bare legs (it’s the 28th amendment) by rocking a pair of American flag jorts. There are lots of ways to go about making yourself a pair of flag shorts, which means you’ve got plenty of opportunities to add your own flair. You could paint the flag on the front of the jeans, or go subtler by just adding a flag design to the pockets. You could use bleach instead of paint for a more subdued stars and stripes design. 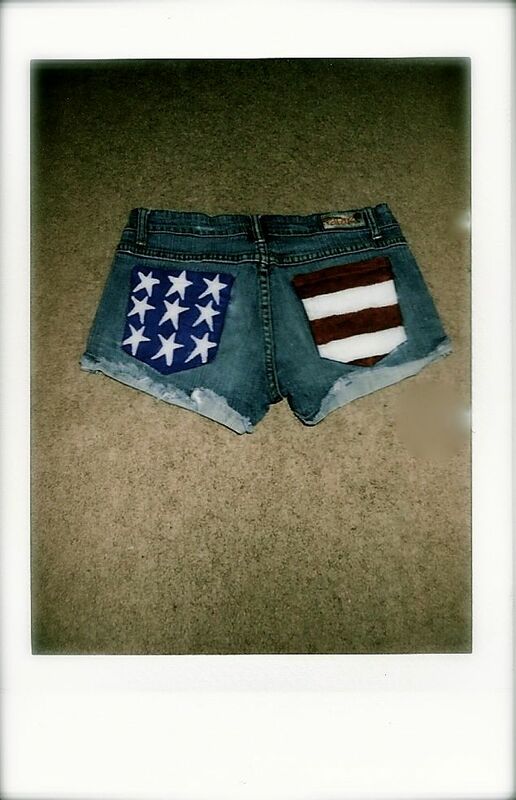 You could even add studs and make your patriotism a little more punk rock. If you want to show your pride this Fourth of July, but you’re not exactly one to break out the giant flag t-shirts and ridiculous top hats, try making a less theatrical statement with your nails instead. If you’re lazy, just alternate red, white and blue polish – but if you really want to make a splash, try out this cool tie-dye effect. Dip dying is all the rage right now. It’s also really easy to pull off, because as the name suggests, all it involves is dipping a piece of fabric into some dye. This site has a great tutorial for making a fashionable red, white and blue dip dyed tank top that’s sure to be a hit at your Fourth of July barbecue. Although I personally haven’t attempted dip dying, as a veteran hapless crafter, I will provide you with one tip: buy several shirts to practice on. Hair chalking is an easy way to add a temporary pop of color to your hair. The color washes out after a few days, but it’s super vibrant when you first apply it. All you’ve got to do is pick up some soft pastels from just about any craft or art supply store, dampen your hair and rub the pastels on the parts you want to color. Then, seal in the color using a flat iron or curling iron. You’ll probably want to wear gloves – chalking can get pretty messy. Why not break out the red and blue chalks and give yourself some patriotic tips? If you’re rocking a shaved or partially shaved style, you could even draw stars on the short pieces of hair!